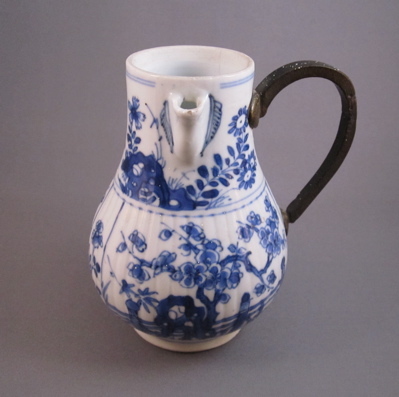 This pear shaped, ribbed cruet jug with beak spout was made in China in the mid 1700s for export to North America and Europe. 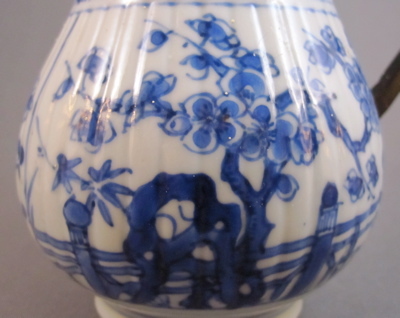 It measures 4-3/4″ high and has hand painted cobalt blue underglaze decoration of cherry trees, floral sprigs and a fence. 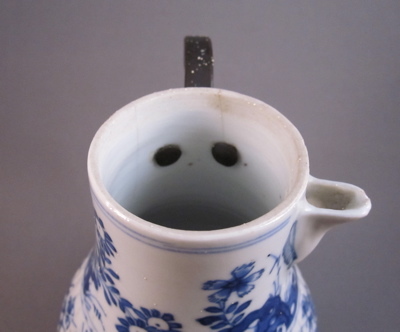 At one point in its early life, the original loop handle, set at a 45 degree angle to the spout, broke off. 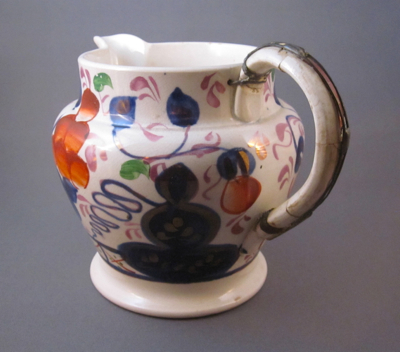 Some time in the late 18th or early 19th century it was taken to a metalsmith who fashioned a sturdy bronze replacement. 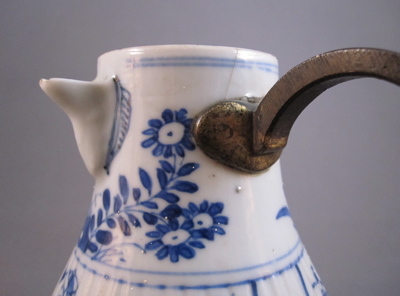 The gilding, visible on the terminals only and not on the handle itself, indicates that it was originally wrapped with rattan. 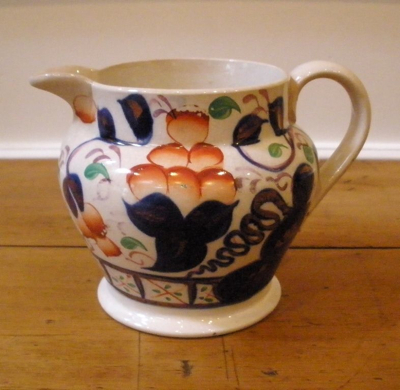 It amuses me to see paint speckles all over the jug and handle, suggesting that one of the owners neglected to cover their treasured items when they painted their room. 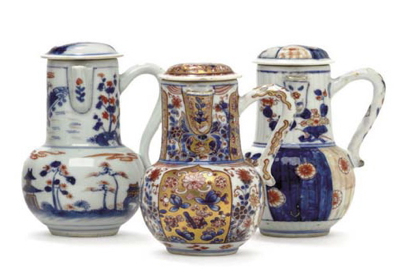 These three examples of similarly formed cruet jugs each have their original handles & lids. 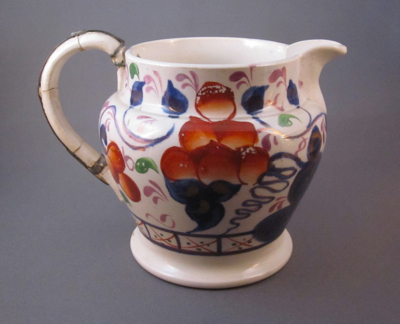 This type of pearlware pottery “Dutch” shape jug, decorated in the Oyster pattern, was manufactured in England and Wales between 1820 and 1860, although about 80% of the production of this popular form and pattern was done in Staffordshire, England. 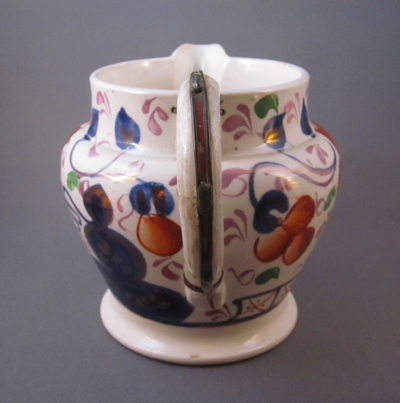 Standing nearly 5″ tall, it is hand decorated with cobalt blue underglaze and pink lustre, green, and burnt orange overglaze enamels. 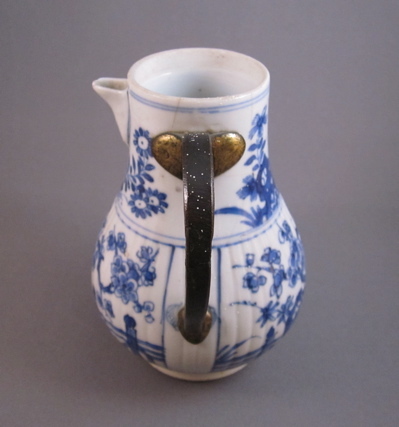 Although this is not a hard to find jug, I have yet to see one with this type of seemingly simple, yet elaborate inventive repair. 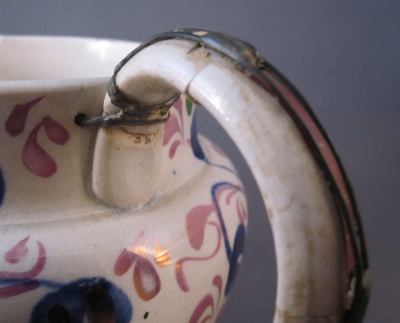 Sometime in the 19th century after the jug was dropped, causing its handle to break into four pieces, a repairer decided to reinforce the broken pieces, rather than create a new metal replacement. 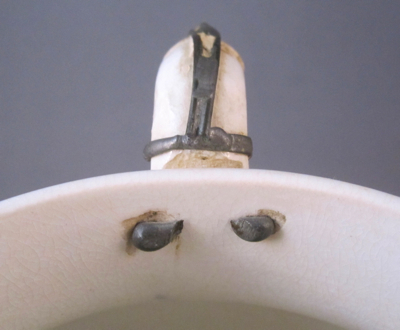 The simple loop handle now contains three metal rivets attached through holes drilled at each broken joint, an iron cuff at the bottom, a ring at the top attached to a rivet drilled through to the inside rim, and a splint made from two thin copper wires soldered to the ends and riveted along each joint. I applaud the anonymous repairer who took a different approach with this type of unusual repair and am glad to have the outcome of his creativity in my collection. 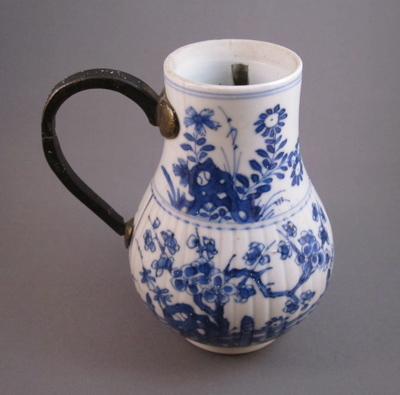 This jug with the same form and decoration has its handle intact. 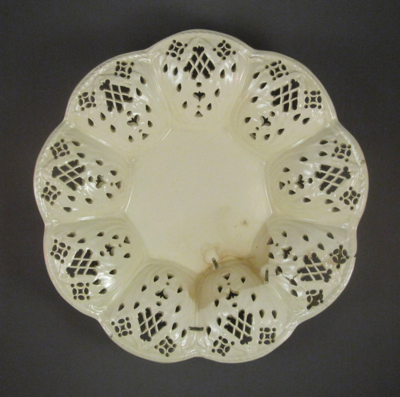 This 8-1/2″ round creamware fruit basket stand with nine lobed pierced openwork panels was made in England in the late 1700s. 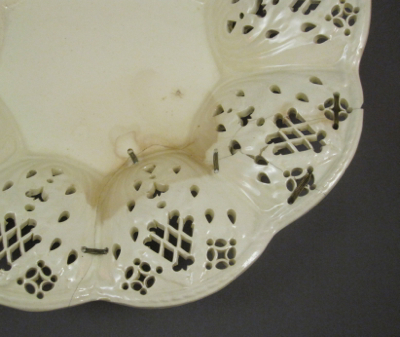 Creamware, a lightweight form of earthenware with a transparent high gloss glaze, was developed by Wedgwood in the mid-1700s and became so popular that it was soon copied by rival potters in Staffordshire, Derby and Leeds. 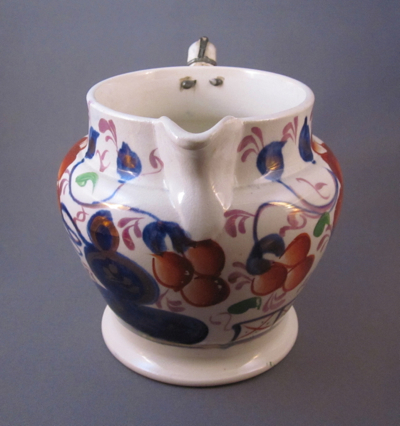 It was originally paired with a matching basket, pierced to allow the fruit to breathe and not spoil as quickly. 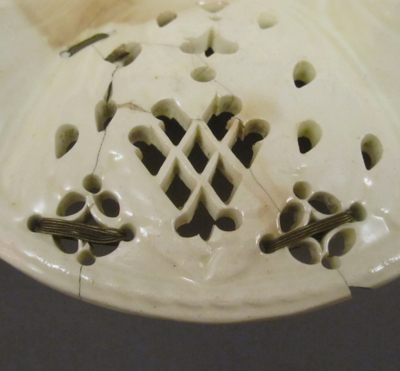 Because the openwork pattern is so delicate, many surviving examples are damaged. But I have not seen many with this unusual repair, which at first glance appears to be a standard staple job. Upon closer inspection you will see the “staples” are actually tightly wrapped bundles of ultra-thin brass wire. 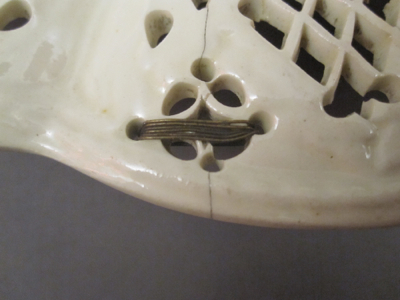 Many of the wire reinforcements pass through the open pierced pattern, making good use of existing holes straddling the cracks. 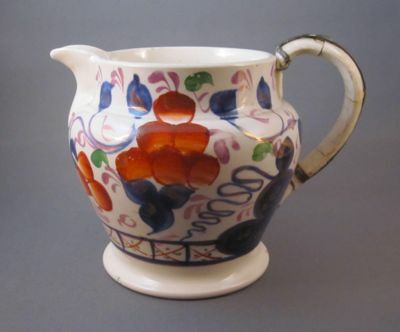 This piece ended up with stains, no doubt a result of the dark fruit juice dripping out of the basket above and seeping through the cracks of the light colored, soft-paste pottery. 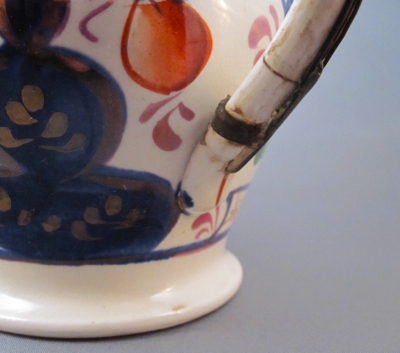 Though cracked and stained, it is a welcomed addition to my collection, especially since it was recently given to me by my high school French teacher who carried it on her lap during a flight from her home in Belgium to New York. Merci beaucoup, Marianne! 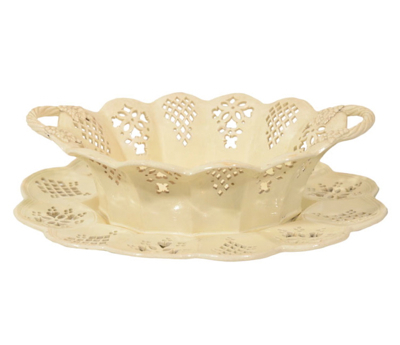 Both the fruit basket and matching stand pictured below are in tip-top shape, neither in need of wire reinforcement.